Want to go here? You can, as long as you’re able to walk. 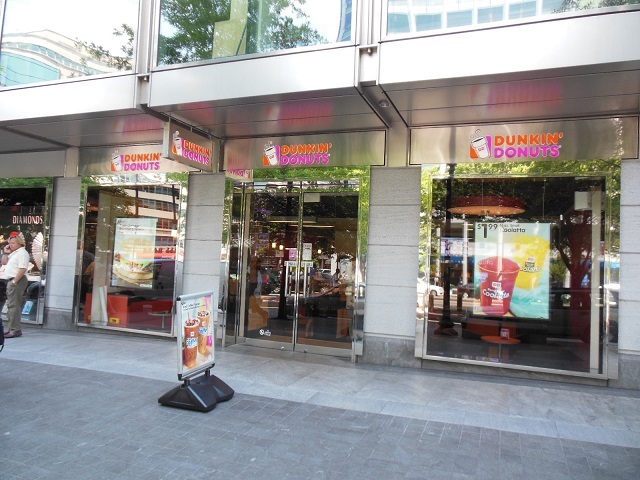 D.C. patrons of a new Dunkin’ Donuts on K Street can enter a raffle tomorrow to win 52 free cups of coffee. Well, it might be a little difficult if you’re in a wheelchair. A few weeks ago, my wife Keri Kae was stunned to see a wheelchair user just holding the door open, unable make it down the stairs and looking hopeless. Someone just as aghast bought him a cup of coffee. She later confirmed with an employee that there was no wheelchair access, not through the main entrance or otherwise. Just thinking about it aggravates me — but I can’t even begin to imagine what this guy felt, and what many after him will feel. I’d be astounded if this wasn’t a violation of the Americans with Disabilities Act. We’re talking brand new construction here; this place just opened. Take a look at photos of the construction for yourself. And there’s room for a ramp — after all, it’s their largest location in D.C.
Maybe it’s legal and some have just learned accept that some places won’t be accessible for them. But Dunkin’ Donuts is a multinational corporation with billions in annual revenue and a very strong brand. Whatever the franchisee relationship is here, this is just appalling. There’s not even a sign on the door. This certainly brings some sad irony to their America Runs on Dunkin’ slogan. How do we fix this? To start, any blogs that wrote about their grand opening coffee raffle have a new inquiry to make. (Update: DCist has already made theirs.) They’re also on Twitter: @dunkindonuts and @dcdunkin. They’re using the hashtag #KSTDunkin. I’m trying to get in touch with the D.C. Office of Disability Rights and DCRA as well. I just hope no disabled veterans go there to buy a Stars & Stripes donut — now available for a limited time. This really disappoints me. I’m currently visiting my friend in NYC who’s wheelchair bound, and last time I was here we had gone to a Pinkberry that I had to go in alone to — there was a good 5″ step to get into this location. We’re headed up to Connecticut & Rhode Island tomorrow, so I hope we don’t encounter anything else similar. Unbelievable!!! With all the modernization of establishments and laws pertaining to disability assistance, I could not believe that they did not consider the people with wheelchair while they were constructing that premise. Yeah, that’s out of control. My entire life, I grew up pushing my Mom around in a wheelchair. Occasions like this were rare, but when we encountered them – so incredibly frustrating and disheartening. You really do feel helpless.